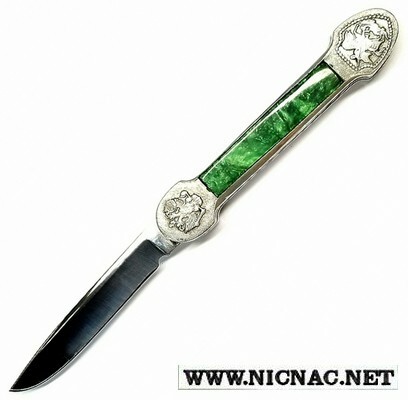 Russian Hidden Release Automatic Knife Coat of Arms Dragon Slayer handle with Emerald Green Pearlex inlays with a Mirror Polished Clip Point Blade. Overall open length is 9 inches with a 3 3/4 inch blade. The hidden release works by pushing pearlex portion of the knife back towards the spine to release the blade.